The team of Olympic Club of San Francisco, winner of the American title in 1920. Behind L-R: Gardner, Steiger, Resleure, Smith. Front L-R: Goodman, Carson, Schultz. The picture appears in the Chicago Sunday Tribune of June 13, 1920. 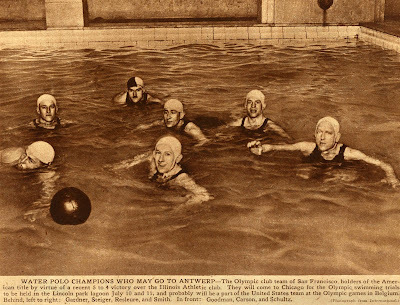 The picture legend says: Water Polo Champions who may fo to Antwerp; The Olympic Club team of San Francisco, holders of the American title by virtue of a recent victory over Illinois Athletic Club. They will come to Chicago for the Olympic swimming trials to be held in Lincoln Park lagoon July 10 and 11 probably will be part of the United States team at the Olympic Games in Belgium.